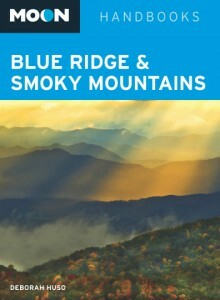 My new book, the first edition of Moon Blue Ridge and Smoky Mountains (Avalon Travel, 2010), will be hitting bookstores next month, but you can pre-order signed copies from my web site right now. The book is part of Avalon’s popular Moon Handbook series, which Money magazine has referred to as “America’s finest travel guidebook series.” My book covers the best of the Great Smoky Mountains National Park, Blue Ridge Parkway, and surrounding areas. Get my personal recommendations on what to see, where to hike, what to eat, and where to sleep. For the latest news on book signings and author events, please visit Moon Blue Ridge and Smoky Mountains’ Facebook page.